The best of both worlds. Traditional swiss watchmaking meets high-tech electronics. A luxurious smartwatch with a matching price tag. A smartwatch that is not only smart but also carries the tradition of the finest swiss watchmaking. Those, who are looking for refined quality and perfection in details, should look no further. 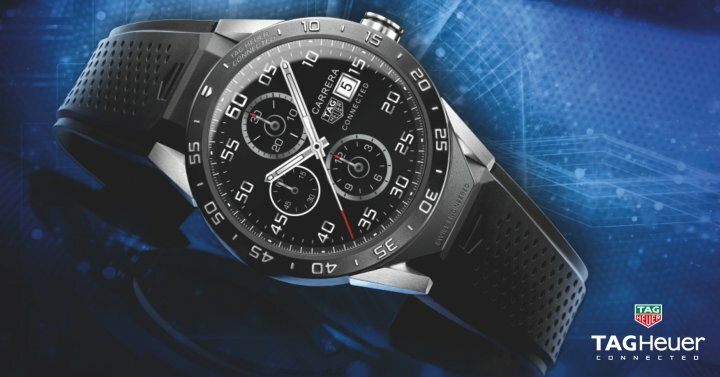 But the TAG Heuer Connected is also technically advanced, using the latest technology from Intel. The watch body is made of grade 2 Titanium alloy, just as the fine brushed lugs, that hold the vulcanized rubber strap. The folding clasps and safety push-buttons are also made of Titanium for extra durability. The numerals on the watch face are embossed and sport a fine-brushed finish. The black, sandblasted bezel is made of carbide-coated titanium and has a special anti-fingerprint coating. The watch is water resistant to 200m (660 ft), which makes it ideal for marine activity and serious surface water sports, but not scuba diving. 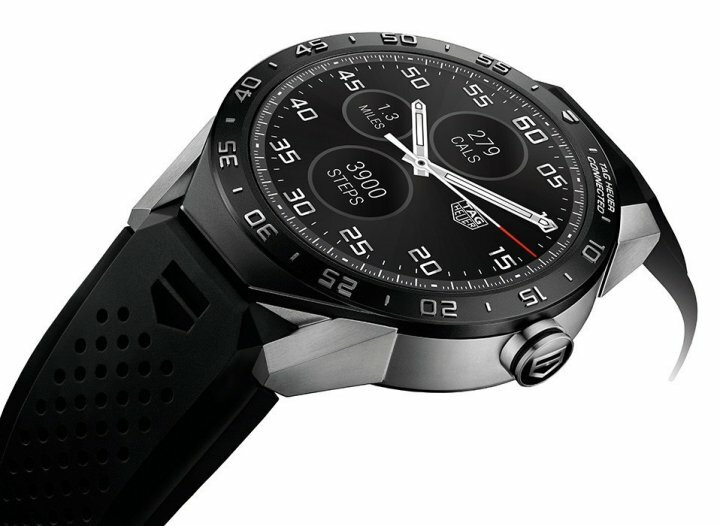 The TAG Heuer Connected is equipped with directional wind and weather monitoring, RaceChrono Pro capability and Google Fit to track your fitness activities. Customizable display options lets you tailor notifications to match your preferences and the Android Wear OS can connect you with thousands of apps available at the Google Play store. Good news for iPhone users, the phone is compatible with devices running iOS system. 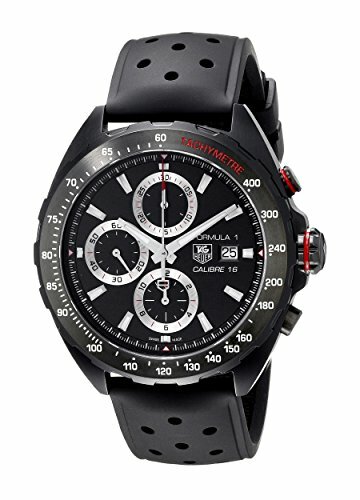 The engineers at TAG Heuer did not compromise on the quality of the electronic parts either. Inside the watch you will find a 1.6 GHz dual core processor from Intel, that is running at 500 MHz under normal operation. The 1 GB of main memory is more than enough to keep the apps running smoothly and the 4GB storage memory can hold all your apps. 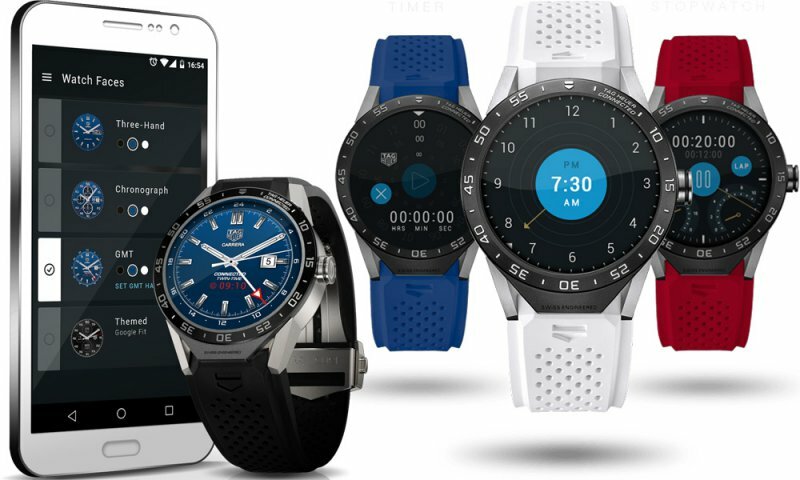 The watch connects to your phone via Bluetooth but also has the option to connect directly to WiFi networks. The rechargeable 410 mAh battery will provide a minimum of 25 hours usage.